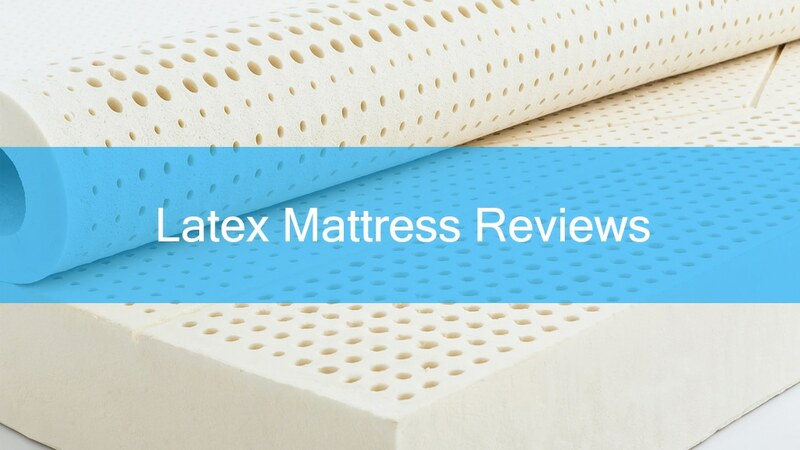 One of the most complex and in-depth types of research in terms of understanding features and options is the latex mattress. These are very popular and satisfactory among owners when you find the right one; in fact, recent research we undertook for our latex mattress reviews has shown them to be considered the second best-rated mattress in terms of overall satisfaction. Before you go ahead and start looking to part with your hard earned money you should clue yourself up with all the different types available in 2019, the processes used to make them, the durability, warranties and so on. Our guide to buying the best latex mattress for your needs aims to give you all the info you require to challenge any sales rep with your knowledge or buy online with confidence in your decision. By the end of this buying guide, we aim to give you the essentials without boggling your mind with useless info and jargon. In its simplest form, a latex foam mattress (and also latex pillows) is a product that has been manufactured using the collected and processed sap of a rubber tree as its internals, instead of using traditional bedding technology like air or springs. They are widely considered to be the best mattress for back pain, most durable, natural and healthy. They are also popular for those with allergies because the hypoallergenic organic material makes them the healthiest and most eco-friendly mattress on the market. Below is an impressive video on how natural rubber latex is tapped and processed. The organic latex mattress is made of processed tree sap, or serum, which is a sticky milky fluid found in the rubber tree. It is collected by a process called “tapping” which means incisions are made into the bark of the tree, the fluid then flows out and is collected ready to be refined using a chosen processing method. It is rare to find a 100% natural latex mattress for sale in retail outlets and showrooms because they are relatively expensive compared to other types due to the cost involved in extraction and manufacturing. If you’re after a natural latex mattress the ideal place to look is online as there will be much more choice and at much cheaper prices. Synthetic means it’s a man-made material, which is made by polymerizing a monomer such as styrene that has been emulsified with surfactants. The result is a material that behaves in a similar way to the organic material mentioned above. The synthetic option is widely available and much cheaper than the natural alternative but has shorter durability and is not as firm. Blended is a mixture of organic and synthetic; usually 80% synthetic and 20% organic, however, the mixture could also be a 50% equal mix, but to cut costs, most commonly the synthetic part makes up the majority. Beware of some manufacturers who claim to be selling a blended latex foam mattress but don’t quote the percentage of natural content. The blended is common, relatively cheap, and offers a good balance of the two types mentioned above concerning build quality, durability and value for money. We’ve talked a lot about the basics of latex mattresses to give you the best idea of what you will be getting if you choose to purchase one. However, these mattresses, like all modern day mattresses, are pretty complex. So let’s discuss some more specifics to help you fully understand how latex mattresses are both similar to and different from other types on the market. Eco-conscious shoppers are sure to love latex mattresses because of their natural materials and environmental friendliness. As we discussed earlier, the latex used in these mattresses is derived from the rubber sap or serum from a tree. The process is just as environmentally sustainable as harvesting maple syrup, so its consumers can rest assured that no harm will come to the world because of their choice of mattress. Another benefit of choosing an organic latex mattress is its natural resistance to dust mites, mold, and mildew. Allergy sufferers and germ-a-phobes alike love latex mattresses for their ability to help you sleep soundly without the fear of congestion or health issues. Natural latex is a great sleeping surface because it offers comfort and support, similar to memory foam, but latex is easier to move on, so you don’t feel stuck in place like on some memory foam beds. Additionally, many latex mattresses are customizable to your needs, so even if you and your partner don’t share the same density preference in a mattress, you can each get what you’re looking for. Finally, the lifespan of even a budget latex mattress is quite a bit longer than that of a typical innerspring. So even though they are more expensive in the first instance, they end up costing less over the lifetime of the mattress. Innerspring usually need replacing after five to ten years, whereas some of the best latex mattresses can last 20 years and beyond if looked after properly. Latex mattresses have been around for many years. In fact, they were sold at major department stores in the 50s. They have long been known for their eco-friendliness, and their ability to promote good health by resisting mold, mildew, and dust mites. However, until recently, they hadn’t been known for their overall comfort. Memory foam mattresses are always highly rated on comfort. They help increase circulation, relieve pressure points, and are generally thought to be the best sleeping surface available on the market today. However, ordinary memory foam is made with harsh chemicals and has recently needed regulation by the US and independent agencies worldwide to ensure the chemicals used aren’t too harmful to people or the environment. Nobody wants to decide between comfort and health, especially when it comes to a bed. You will spend a considerable percentage of your time in bed, so it’s important to “have it all” with both comfort and health. That’s why newer hybrid mattresses actually feature latex and memory foam, with the latex usually being the topmost layer which the sleeper will be in contact with. So you really can have the best of both worlds. In the end, latex foams are just as comfortable and ratings are just as high on comfort scales as memory foam, but with many more health benefits and an eco-consciousness that does not exist as often in traditional memory foam mattresses. For a full breakdown of the two, please check our comparison on latex vs. memory foam. Innerspring mattresses have been around forever. They are what most of us think of when we think of a mattress. They come in many shapes and sizes, and are typically topped with some sort of added cushioning, along with batting or other fibers for extra plushness. Innerspring are considered some of the most readily available and affordable mattresses on the market, although their lifespan is relatively short when compared to other types around today. They are also typically covered in chemical flame-retardants, and it is not possible to find one that is “all natural” or organic. Latex mattresses have also been around for many years, but not in their current foam form. Nowadays latex mattresses are built to be comfortable and luxurious. They are made in layers for both support and comfort and are possible to be customized to individual needs. All of this comes with a much higher price tag too. Where innerspring mattresses commonly begin to sag and irritate pressure points like shoulders and hips, modern latex mattresses alleviate that pain by pushing back into these pressure points. This makes them especially good for people with chronic back and joint issues. 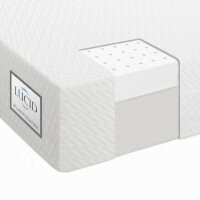 What Is A Hybrid Latex Mattress? As the name suggests, hybrid latex mattresses combine latex with another type of mattress; typically memory foam or innerspring. The average hybrid latex mattress comes in multiple layers; a foam or spring base to support the core and offer additional stability, a spring or foam core to create the height and provide support while reducing motion transfer, and finally, a comfort layer made from latex. This combination is known as latex over foam, and an example of this would be the Ghostbed reviewed below. The layers can also be reversed, and would then become a foam over latex setup, although this is a less common formation. More on these two later. Various elements in a hybrid latex mattress can be customized, like the density of the foam or the gauge and number of coils in the core. All of these factors make a big difference in your comfort, so if you’re thinking about a latex hybrid, make sure you understand what firmness level you are looking for, and review warranty information to ensure you are getting the best coverage for your mattress. With more elements and layers than traditional innerspring or traditional latex mattresses, hybrids can come with their own set of problems. However, they combine the better of two very popular mattress worlds with great comfort at affordable prices. Medium-firm latex foam mattresses are ideal for relieving and reducing back pain in chronic and occasional sufferers. Sleeping on your back on a medium-firm mattress is suggested by doctors as the number one way to avoid or eliminate back and joint pain; the lack of pressure points along with the customizable support of latex mattresses is a great way of achieving this. Of course, side, stomach, and fetal position sleepers are welcome on latex mattresses as well; you will want to customize your density to fit your sleeping position best. We will discuss a couple of the more popular sleeping positions below for examples. For side sleepers, a medium to soft option would be best. Your body can sink naturally into the mattress in the areas that would take on more pressure from this position under normal circumstances. If this is your position of choice, make sure you sleep with a firm pillow between your knees so your hips and spine can stay aligned properly. Stomach sleeping is never recommended because it causes your neck to be misaligned with the rest of your spine. However, if on your stomach is the only way you sleep, be sure to get a medium-soft density mattress. Doing so will allow your body to sink in correctly to not create pressure points on the shoulders or knees. This literally means the whole mattress from top to bottom and edge to edge is made of latex, whether it be 100% natural, blended or synthetic, Dunlop or Talalay; there could be one or more layers, but the trait is that there are no other layers (apart from the flame retardant cover). Unfortunately, these are usually less common in the marketplace and more expensive. On the positive side, they provide good motion isolation and have no off-gassing issues (unlike memory foam mattresses). They also provide exceptional orthopedic support which also makes them the undisputed best mattress for lower back pain relief. As the name would suggest, this type is a multiple layered design which has a thinner top layer of latex over a thicker foam base which is usually cooling gel or visco memory foam. These are slightly more available than the above but depending on the thickness of each layer would determine the overall price you pay. They are cheaper than an all latex mattress, but are still great for joint pain or reducing back problems, and provide good motion isolation. Here you’ll find the opposite of the above, which is a thinner gel or visco memory foam upper layer over a thicker latex base. In a multiple layered design it’s also commonly seen to be inserted in-between the foam top and a foam base platform, if so this layer could be as little as 2 inches thick. This is the traditional processing method which has been in use since the 1920’s. 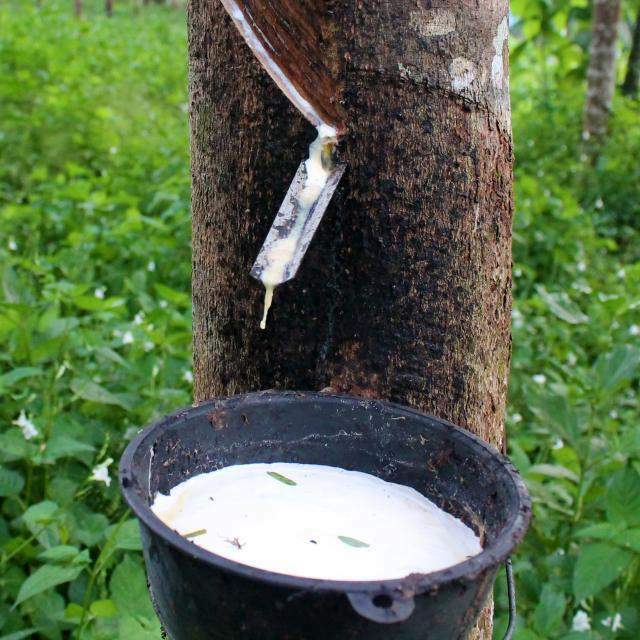 The extracted liquid sap from the rubber tree is poured into a mold and heated, or baked into its solid form. The gradually cooled lump which you’re left with is then removed from the mold which is what makes your Dunlop latex mattress core. This method creates an often inconsistent core in that the sediments tend to accumulate at the bottom which creates a softer overall finish at the top and gradually becomes harder at the bottom. The Talalay process is similar to Dunlop but adds two extra steps. After the liquid is poured into the mold, the mold is sealed closed, and a vacuum is created (additional step 1) to disperse the liquid serum throughout the mold. The serum is then flash-frozen (additional step 2) before it’s baked into its solid form. The cooled lump is then removed from the mold and what you then have is your Talalay latex mattress ready to be wrapped and refined into an end product. The two additional steps between the processing methods make all the difference in the characteristics of the end product. The Talalay process takes twice as long to manufacture than Dunlop; this manufacturing cost reflects on the overall price of the finished goods, which essentially means that a Talalay latex mattress will tend to be more expensive than a Dunlop. Dunlop is dense, so it is firmer and widely adopted as a base platform (like in the LUCID 16″ reviewed below). Whereas Talalay latex is good for a more soft or plush finish so makes a great comfort layer (like in the DreamFoam Ultimate Dreams 10″ review below). Our advice is that neither is better than the other, it all boils down to personal preference and budget. The whopping 16 inches of this hybrid latex and gel foam mattress is full to the brim with many layers that work together to bring you optimal spinal support and a refreshingly comfortable night of sleep. 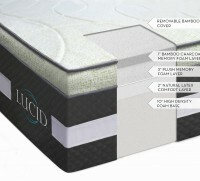 This unique four-layered mattress (Queen size on review) consists of one inch of quilted bamboo charcoal foam on top, three inches of plush visco foam in the upper middle layer, two inches of Dunlop latex comfort below that and a ten-inch high-density foam base. The combination of latex and traditional viscoelastic memory foam provides excellent orthopedic support and pressure relief to help reduce neck, shoulder, and back pain. This mattress uses open cell technology to prevent your body from creating a lasting crease, even if you sleep in the same spot every night. It is also shipped on a bed in a box format for your convenience and ease of setup. Here’s an extremely popular choice from a household name in the US. Widely considered as the best latex mattress in terms of value for money, customer satisfaction and overall general quality, this highly recommended 10″ model offers the same pre and post-sales customization as their other mattresses. However, the combination of foam and 3″ Talalay latex comfort layer means this one is slightly cheaper than their all latex mattress, but is still suffice for even the fussiest people, and comes with a very appealing price tag too. 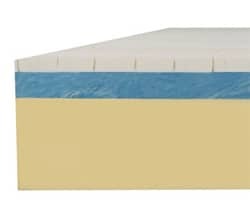 The choice to place latex over foam means the sleeper is in close contact with the hypoallergenic area but is still provided with optimal back support by the high-density base on which the upper layer resides. This combination is becoming increasingly popular among consumers due to the high value at low prices. We rarely have two reviews from the same manufacturer but this is one of the top rated mattresses for sale which we couldn’t resist writing about. LUCID is a respected player when it comes to combining materials, and this is no exception; the 10-inch queen has a 3″ natural latex comfort layer and a 7″ high-density visco memory foam support base. Without fail, the surface responds instantly to your movements which offers immediate pressure point relief and can eliminate sleeping with pain, leaving you fresh and revitalized each morning. Available in all the common sizes and with a 25-year warranty, there’s not much else to weigh up. Our latex mattress reviews and owner satisfaction surveys always rate well with their products and this is a typical example of why. A great value product from an established American family run business, the Ghostbed is 100% made in the USA and packed with innovation. 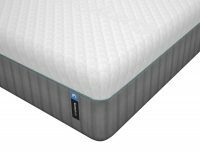 Featuring 11″ of goodness, it has 1.5″ continuous aerated latex, 2″ 4 lbs cooling gel memory foam and 7.5″ extra high-density support foam, it is also rated one of our best cooling mattresses. This is a medium-firm bed, so it is ideal for back sleepers and people who suffer from pain in the night. It is an investment that will last for years to come without losing any of the great features and benefits you have come to know and love. There is a removable cover which is plush yet durable and is zippered too for easy removal and care. 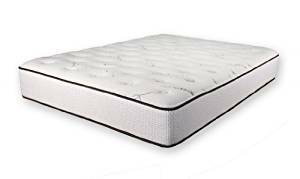 You will be hard pressed to find a gel and latex mattress at such a low price from any other brand; this is a great entry level effort that deserves 5 stars for comfort, support, build quality and overall value. It comes in all the common mattress sizes and is provided with a 100-night sleep trial, free returns, and a 20-year warranty. The Brooklyn based company DreamFoam has been in the industry for decades. They are indeed experts in the field, not just in delivering high-end products, but also when it comes to making their customers needs their number one priority. Their dust-mite resistant and naturally hypoallergenic 12″ Talalay latex mattress is custom tailored to your desired firmness. Although this one isn’t the all latex option which is high ranking in their range, the Eurotop sits above a high-density foam base for superior support but more to do with customization. After purchase, you will be contacted to customize the firmness level, and even then if it’s still not right, you can contact customer services to swap out the comfort layer which is made possible by the zippered Eurotop cover. Combine an excellent customer service feature with a company that knows how to make some of the best latex mattresses on the market, and you simply cannot go wrong. Perhaps the best natural latex mattress in the PlushBeds Botanical Bliss range, it feels soft and secure at the same time, and being natural ARPICO has absolutely zero maintenance. It also has less influx of dust mites, bacteria and other types of mold. It’s claimed that less than 1% of US latex mattresses can meet requirements of the certifications from GOLS (the Global Organic Latex Standard), but the USDA organic Certified Botanical Bliss from PlushBeds has achieved it. You are getting true quality and eco-friendliness in this bed. The version on review here is 10”thick and consists of three interchangeable layers for the utmost customization ability. Simply rearrange the layers within the zippered cover to get the best feel for your needs without having to sew, stitch, glue, or otherwise hassle. The combination of latex layers ensures that the pressure points in your body are relieved no matter which sleeping position you prefer. That means a more comfortable sound sleep for you and your partner. The beauty of this organic latex bed is that it is both rigid and conforming to the shape of your body. It, therefore, gives you the perfect balance between a soft platform and a firm support for the contours of your body. This particular model is available in a medium, or a medium-firm option too. The PlushBeds Botanical Bliss comes with a pure New Zealand wool liner, which has moisture removing and naturally antimicrobial properties. What you get as a result is a fresher and cooler sleep surface. Manufactured in the USA and known to be voted #1 best latex mattress value by consumers, this one is hard to surpass. Of our latex mattress reviews, this is one of our favorites due to its 2-sided design. Yes, it is possible to flip this mattress for longevity, although the actual premise behind the ability to flip it is for alternating comfort levels more than increasing lifespan. 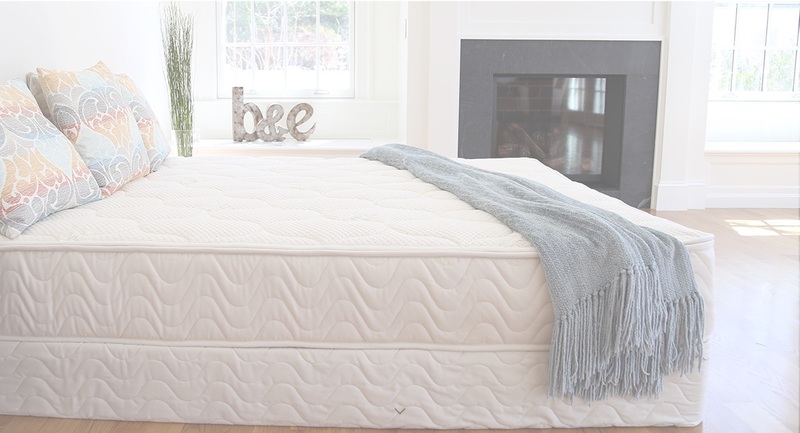 By using solid natural latex on both sides, the Dunlop and Talalay processing methods really come into play. If you are a side sleeper who prefers a slightly softer surface, position the reversible mattress with the soft side up (24-26 ILD). If you’d prefer a firmer layer of support directly beneath you, simply flip it over (29-31 ILD). No need for opening covers and swapping around layers like some other latex mattresses listed here. Whether you buy the 9, 10, or 13-inch thick version, each one has a 1″ thickness GOTS certified organic cotton cover. As expected with a mattress of this caliber, it is made in the USA, ships compressed and rolled up, is available in all the sizes you’d ever need, comes with a 20-year warranty, and a 120-night trial when purchased directly from Latex For Less. This 10″ high 4-layer natural latex mattress is built with a cleverly infused graphite. Processed using the Talalay method, as the manufacturer claims, gives you firm support while conforming to your body shape for a good night’s sound and restful sleep. What makes this graphite infused Talalay latex bed such a fantastic sleeping solution? It has patented heat absorption technology, which absorbs heat and gives you a cooling sensation throughout the night. But it does so naturally, without the use of harsh chemicals that can off-gas into your home. Underneath this cooling layer, there are three additional layers. The second is a 1” gel swirl memory foam that adds durability and extra cooling for hot climates or partners. The third layer is 1” of viscoelastic memory foam, which is what gives the consistent support and ensures the longevity of lifespan. Finally, there is a high-density support base. This is also designed to offer increased support to your body. For those with musculoskeletal problems and allergies, the American made Talalay Zenhaven is quite possibly the best natural latex mattress for sale in 2019. Aptly named, this one is organic and pure. The initially soft and springy nature of the material alleviates stress on your muscles and bones as you lie down, and conforms to your body to align help eliminate pressure points. Once you’re lying down, the rigidity kicks in to support your body weight and ensure your spine remains aligned throughout the night. Being a 100% natural latex mattress all the way through its 10″ height, the Zenhaven is an excellent sleep option, as it provides a unique combination of soft touch, yet a firm support that is ideal for relieving pressure from the sensitive joints of the human body. It comes with a quilted organic cotton cover which all adds to the “eco-friendliness of the product. It is hypoallergenic and contains zero synthetic foams, so this is about as close to being at one with nature as you can be during a healthy indoor slumber. The Zenhaven comes with a 20-year warranty and a 120-night in-home trial to ensure your satisfaction and comfort with the product. The Spindle Mattress is made from 100% natural latex, which is an ideal choice when it comes to picking the best mattress for side sleepers because of its soft yet supportive capabilities. This version is a total of 10″ high. The base layer consists of 3″ pure organic latex. This is the layer that maintains the rigidity and adds the support and durability required for all body size and weights to be comfortable for a very long time. Above this layer is a 3″ Dunlop foam variety that has been added for a plush and more cushioned feeling which gracefully accommodates hips and shoulders to provide the perfect spinal alignment without pressure points. The final layer at the top is the 1” organic quilted cotton cover to keep your mattress looking great and ensure good health for years to come. The Spindle Mattress is Oeko Tex Certified, which means there are no fire retardants, no polyfoam or no synthetic latex used. This certification is done by an independent firm worldwide and is one of the strictest certifications you can find for safe textiles, so this is a big win for the Spindle. This is a relatively new product, which is indeed worth considering, especially given that it’s handmade to the highest standards and comes with a 10-year warranty for added peace of mind. Unlike some others, the Spindle isn’t available as a latex mattress topper if you fancied a cheaper and easier alternative, but it is still relatively inexpensive for all that it offers and will allow you to sleep and feel utterly luxurious at affordable rates. Although latex mattresses are generally made of pure organic material, as you may have learned throughout this guide there are various ways in which it can be used for sleeping on. For example, it could act as a base platform or a top-level layer, usually in conjunction with viscoelastic or gel foam, which are man-made materials. This combination of the two materials to form an inner structure makes the product more of a hybrid latex mattress if anything. There is nothing wrong with hybrids, but to reap the benefits of a latex mattress, it’s better to have the latex layer closer to the top, as opposed to used at the base. Many of the latex mattress reviews here are latex over foam designs, which is fine, and some are all-latex. Which one you purchase is most likely going to depend on your budget. If you can afford an all-latex mattress then great, but a hybrid offers excellent value too. To conclude our reviews, we opted in favor of the DreamFoam Bedding Ultimate Dreams as the best latex mattress of our top 10 here. The company who manufacture and supply this product offer a great service which allows you to request the comfort level as soon as your order is placed. Once it’s in your home, if unhappy with your selection for any reason regarding comfort you simply contact customer services. They’ll happily exchange the comfort layer and tailor for you a different density which would make it either more soft or firm, whichever you request. 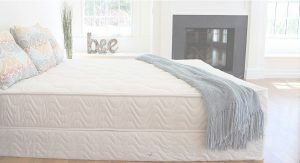 The excellent customer service and flexible pre/post sales options aren’t the only reason why we think this is the number 1 choice; the product itself has a high-quality natural Talalay core (not blended) which can be swapped for a Dunlop if preferred when you place the order. It also uses organic wool which is great for countering allergies. This is a USA made product where checks and compliance are about as stringent as can be, so be assured you’ll be sleeping safely. All of this combined along with the verified high owner satisfaction surveys make this top of our reviews for 2019. Very informative review of types of mattress. I enjoyed reading and learning more plus a price list for each kind. Thank you. M.Y. Thank you for the very informative and apparently factual article. If you discussed platforms/box springs. Isn’t there a specific platform required for use with each of these mattresses? Most of the latex mattresses on the market today are compatible with almost any type of foundation i.e., platforms, box springs, adjustable beds, on the floor etc. If there’s a specific mattress that you’re interested in please let me know your foundation and the mattress, so that I could double check for you. Right now I am looking for a 15 inch clearance under the bed a 9 inch platform adjustable frame and a 13 inch mattress height. I want lumbar support and a lounge and zero gravity setting. I also am looking for a 100% natural latex mattress in firm. How do you compare. Thanks!